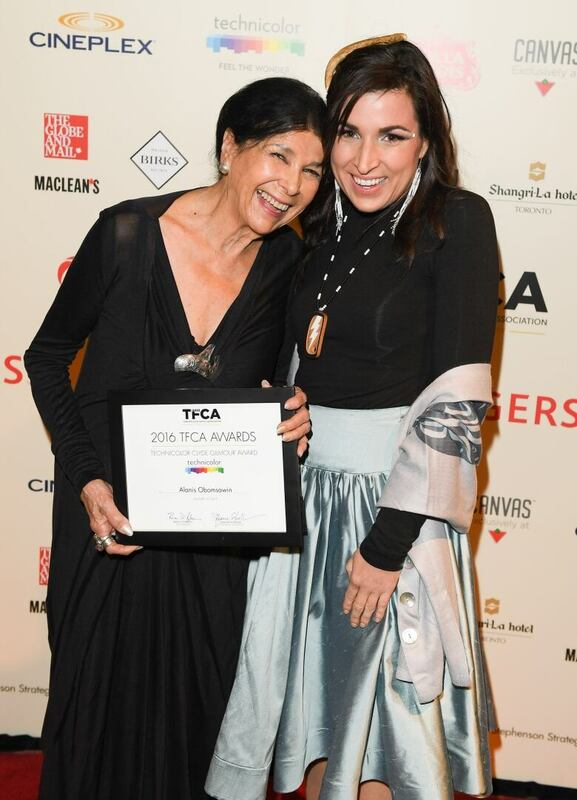 Vancouver artist Amanda Strong's "hybrid doc" made such an impression on Alanis Obomsawin that the icon awarded her $50,000 in film services. When Alanis Obomsawin was told she could give $50,000 of post-production funds to any Canadian filmmaker, she didn't hesitate. She named Amanda Strong. "I immediately thought of her," Obomsawin, an officer of the Order of Canada and two-time Governor General's Award winner, tells CBC Arts. "When I saw her last film (Four Faces of the Moon), I was very touched by it, very impressed by her work. She obviously has important stories to tell." And Tuesday night, she accepted it at the Toronto Film Critics Association Awards, announcing her support of Strong — a major honour, and one that came as a major surprise when Strong got the news awhile back. 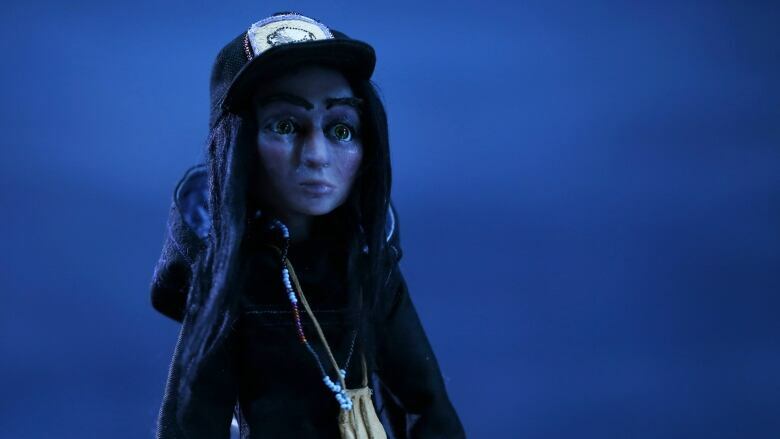 When she showed Obomsowin Four Faces last fall, during a pre-TIFF screening at the NFB, the 32-year-old artist didn't expect the Canadian film icon to even remember her. 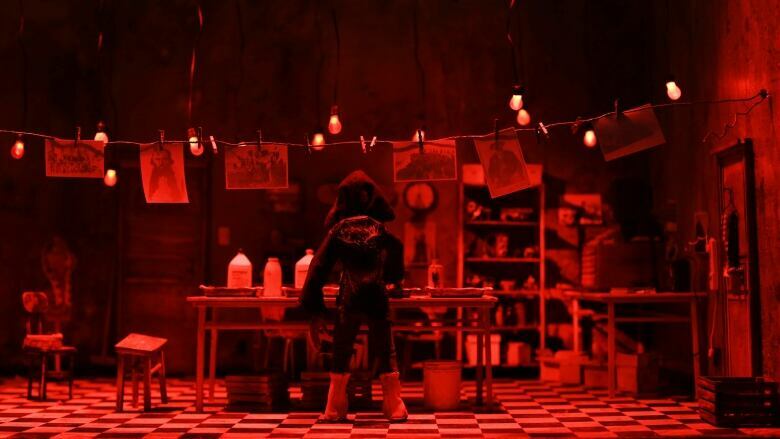 The piece, like many of the Vancouver artist's short films, is stop-motion animation. One one level, it's a history of the buffalo hunt of the 1880s, and how mass extermination of the animal was ultimately tied to the systemic destruction of the Indigenous communities who depended on it for survival. But the story follows Strong's own family history through time, told with minimal dialogue in the languages of her ancestors (French, Michif, Anishnaabe, Cree) and beginning and ending its time-travelling journey in the present day. After screening at TIFF and VIFF last year, it'll appear on CBC Short Docs this spring. While it's certainly dream-like in its narrative, the film is grounded in reality. "I like to say that if documentary means truth — or discussing the truth or facts about something — this is our truth," Strong tells CBC Arts. Four Faces is just her most recent "hybrid doc," as she calls them. Her 2015 short film, Mia, is a piece about environmental destruction — told through the story of a girl...who turns into a salmon. "Our oral histories, our oral stories are our truth," says Strong. The making of Four Faces, she explains, begins with the knowledge passed down from her grandmother Olivine Tiedema Bousquet, a former senator for the Métis Nation Ontario who was born and raised in St. Boniface, MB before moving to the Toronto area. "For me, my background is Mé​tis, and that's who my grandma is," says Strong, who's been close to her grandmother since childhood, growing up in the Toronto suburbs. "I always knew I wanted to do a story about my grandma because she's had the most impact in my life," she says. "I could have done talking-head interviews and put some historic photos together. I always knew that's not what I wanted to do." Four years of research and character development went into the film, she says, beginning with some genealogical sleuthing that Strong has mapped all the way back to the 1600s. 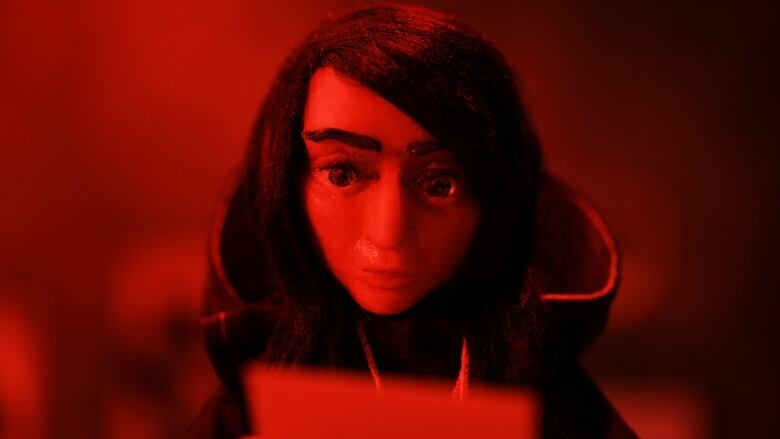 In Four Faces, she animates a puppet version of herself — who travels through time, cameras strapped to her back, to meet her ancestors. While she was learning about her family tree, Strong was simultaneously studying records of the buffalo hunt. "The more I would learn, the buffalo piece really tied it all together," she says of her family's history — and how culture and language was not passed from generation to generation. "My grandma's grandfather knew six languages," says Strong. "I don't know anything other than English." "How did those languages get lost just like that?" 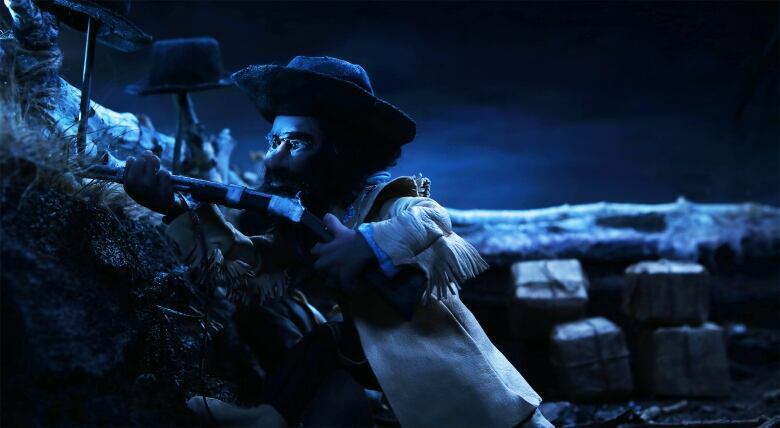 In Four Faces of the Moon, filmmaker Amanda Strong goes back in time to visit ancestors including great great grandfather Napoleon Bousquet, who fought with Gabrielle Dumont at the Battle of Batoche, and John Baptiste Wilkie, a buffalo hunt chief who organized Metis and Indigenous people to create protocols for the hunt. For Four Faces, Strong reached out to elders to provide translation and voice-over in the languages related to her bloodline. As the film progresses backwards, then forwards, through time, the languages change — so while the film is subtitled in English, you don't need dialogue to feel the cultural shifts between generations. "What I find beautiful about animation is it can be a very interpretive journey," Strong says. "Everyone who watches it can go through seeing themselves." 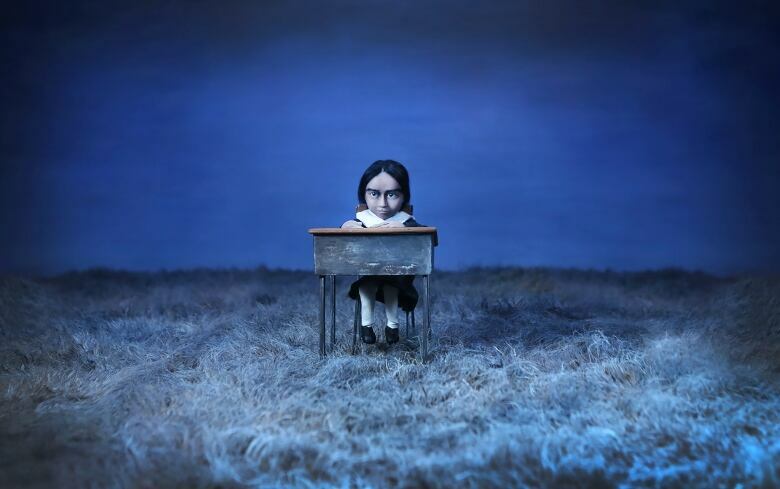 The way the film uses language resonated with Obomsowin, she tells CBC Arts. "I was very touched by it," she says. "To express life experience and culture and tradition through animation and documentary filmmaking is wonderful. It's the best way to educate, and it's the best way to express yourself and make your traditions and your people known." "I do agree that film's a really transformative medium to start dialogue," Strong says. "Filmmaking, animation — these are things that I think really affect people. What they hear, what they see: the pairing of that is really powerful." Strong's upcoming projects are also rooted in Indigenous culture. A graphic novel version of Four Faces is in the works with Annex Press, a book that will include more in-depth information on the buffalo hunt and Strong's own family connection to the story. She and her partner Bracken Hanuse Corlett are adapting Anishinaabe author Leanne Simpson's stories for an upcoming short film, Biidaaban (Dawn Comes), and they're hoping to put their $50,000 in prize money towards a film project called Wheetago War, a tale about a cannibal spirit similar to the wendigo, based on story by Richard Van Camp. But as wide-ranging as those stories might be, she says her work always begins in the same place. "I think a lot of my work has always dealt with very emotion based things whether it's personal, like a breakup. I feel it evolves from there and no longer becomes just about me," she says. Four Faces, she says, "is just my personal journey and experience. ... I can only hope that it will bring dialogue to what happened." Four Faces of the Moon is coming soon to CBC Short Docs. Learn more about Amanda Strong's work at her website.